We all have to give presentations at different points in our life that might be for school or work or an organization that you aren't involved with. No matter where we give the presentation or to whom. We want to make sure that it has the impact on our audience and that it becomes memorable for our audience. Here are 7 best tips that are going to ensure you and nail your presentation and leave a lasting impression on your audience. The first step in preparing for any presentation is that you should get a better idea of who your audience is. Knowing your audience will allow you to understand the type of content they are going to be expecting with regards to depth and technical detail. You wouldn't want to give the same presentation to a group of high school students, who are interested in entrepreneurship. But you are going to a room, full of founders and CEOs because their expectations and level of understanding will be on completely different levels. Dig up as much as you can about who your audience is, what industries they work in and what positions they generally hold. This will allow you to really tailor the content and deliver your presentation in a way that will really make it stand out and be memorable. Too many times people give a killer presentation at one venue to a group made up of their core audience and then fails on the same presentation to a different group because they didn't make the changes they needed to better address the new audience. Just because you kill it in one audience, it doesn't mean that the same and exact content will replicate the reaction with all your audiences. If you stand up and give a presentation and all the points you want to make are just tossed around randomly and they don't make any sense. Then no one enjoys your presentation and remembers your and it it's likely that it's not for the reasons that you want them to. However, if you structure your presentation in a way that each idea, each section builds on the one before it, you help your audience connect with the content and create logical links between your concepts. This is a great way to make more complex ideas easier for your audience to understand and remember you and your presentation. Another great tool to cement those ideas in the mind of your audience is to use visuals like charts, graphs and infographics to illustrate and communicate your concepts. As many as 65% of people are considered to be visual learners and if you don't take this approach in your presentation you are going to ignore and loss the vast majority of your visual learners. Using an image regardless, it's a picture, a graph or a chart can be a much more potent conveyor of information and it has a much more powerful impact on your audience. “A picture's worth a thousand words” it really is. If you had to stand in front of your audience and go through every data point verbally, it can get bad quickly and this is much more common of an occurrence than you might think. But if you visualize your data for your audience with a graph or chart then you will instantly make it much more understandable and memorable to your audience. Showing someone 200% growth with a graph is much more exciting than explaining it while they're looking at the raw data. Having a bit of structure in your presentation goes a long way in keeping the audience engaged because your audience can follow the information step by step. But even more than just structuring the flow of the presentation you also have to build a repetition. This will encourage people to remember the key points of your presentation and helps to stick, which again makes you and your presentation more memorable. Just to give your audience a brief rundown of the key points and move right into the body of your presentation and tell your audience exactly what was highlighted at the beginning. But obviously with more detail and extra elements that you add in, to make your presentation stick in the presentation by telling them what you just told them. Reminding your audience of the key points in a brief summary for final repetition helps to reinforce the main points of your presentation and try to do it for at least three times in the beginning, middle and at the end. Find a way to do this, that it feels natural and not overly scholastic. The difference between an average presentation that people zone out of and a great presentation that keeps them engaged is how you convey the information to the audience. A great way to convey the information or key points of your presentation is to use a story. By using a story preferably an interesting one, you can get your point across and you're also creating a moment in your presentation that is more memorable and easier for your audience to recall later. It's also hopefully going to be something that catches their attention and pulling them into what you were saying. One of the keys here is that it has to be a story you can tell with commitment and it has to be true. Always be honest and do not bluff with your audience, because if you do that, they will know and you will lose all your credibility. Being relatable is actually one of the most important factors in your delivery. You want to be someone so that your audience can relate to, that they would feel comfortable with talking to. Even when giving a talk as an expert on a topic you have to make your audience to feel the relationship between you and your audience. It helps them mentally engage with your content and remember you and your talk. Most people don't feel comfortable going up and talking to a stern authority figure and no one wants to listen to someone with no confidence. So, there's a fine balance you need a strike and here's how. The most important thing you can do to come across to be more relatable by being yourself and more authentic. Another great way to accomplish this is to stay relaxed, which can be difficult if you're not used to presenting but this goes a long way and this helps people to see you as relatable. The final way you can be more relatable is to be enthusiastic about your presentation. Your enthusiasm will transfer to your audience and your enthusiasm will be noticed by your audience. This might be the last tip but it is one of the most important tips that everyone should have confidence. Confidence in what you do is by far the most important element of your presentation. Having confidence as an authority on everything you say during your presentation. But you're not going to develop the confidence you need if you don't practice a lot. When you are practicing a presentation it's not enough to sit in front of your computer and go through your contents. You should also practice in front of other people. Invite some friends over and ask them to give some feedback on your presentation and make improvements based on their feedback. 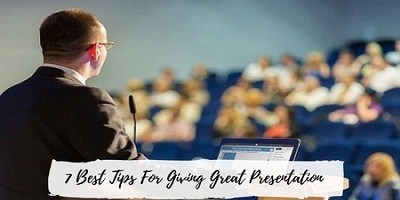 I hope, using these 7 tips you should be able to put together and deliver a masterful presentation that will keep engaged your audience and remember you and your topic and leaves a lasting impression on your audience.